The latest National Survey on Drug Use and Health contains good, bad and ugly news. I’ll take it from the top — and focus on youth marijuana use in Colorado, where I serve as medical director of one of the state’s largest adolescent addiction-treatment programs and also direct school-based clinics in six public high schools in Denver. My patients are ages 11-25 — and a full 95 percent of them are admitted for treatment of their marijuana addiction. It is an annual, national household survey — which is important to note because youth struggling with substance addiction are often not in school to participate in other surveys tracking American youths’ substance use and attitudes about drug use. NSDUH results are broken down by state — and the latest results comparing 2014-15 and 2015-16 are found online here. – Rates of past-month use because recent use suggests more frequent use that can be consistent with problem use. – Rates of first-time use. The earlier a person starts using an addictive substance, the greater their risks of experiencing a range of poor outcomes. Early use of marijuana is associated with school dropout, IQ loss and psychosis. Marijuana use rates among Colorado teens: This is perhaps the brightest spot in this year’s report — but it’s not as encouraging as marijuana-leglization supporters want you to believe. In Colorado, 9.08 percent of youth ages 12-17 used marijuana in the past month — compared to the national average of 6.75 percent. So that means pot use among Colorado’s 12-17 year-olds is 34.5 percent higher than the national average teen use rate. Colorado teenagers also rank second in the nation — only behind teens in the fellow marijuana-legalization state of Alaska — for first-time use. If there is any good news to be found in Colorado’s teen marijuana use rate, it is that it is slightly lower than last year’s rate of 11.13 percent and also steady with the use rate of 10.17 percent recorded in 2009, the year of Colorado’s de facto marijuana legalization. But here’s some bad news: Despite this small drop, the rate of marijuana use among Colorado teens is 34.5 percent higher than the national average rate of teen use, and Colorado teens also rank second in the nation — only behind kids the same age in fellow legalization state Alaska — for reporting first-time use. 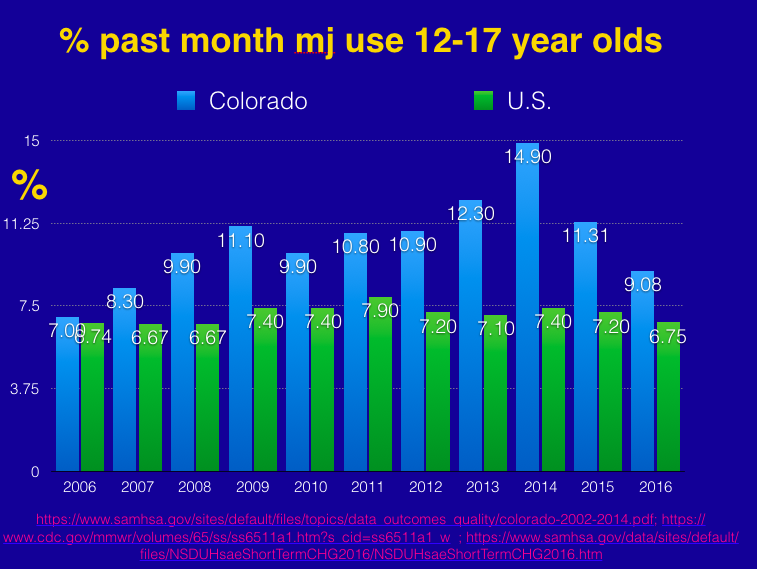 Colorado teens’ current use rate is also significantly higher than the rate of 7.6 percent recorded a decade ago in the 2005-06 study, before the ramp-up of commercialized marijuana. 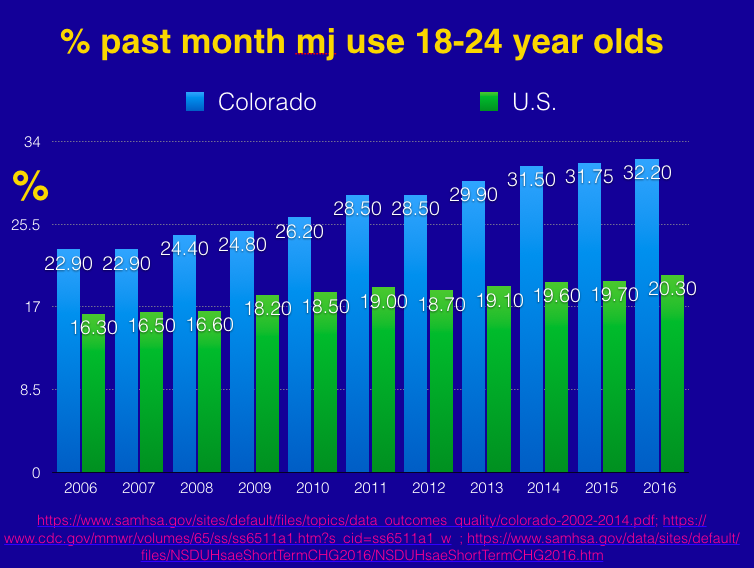 Take a look at this graph charting Colorado’s teen marijuana use rate compared to the national average. Colorado’s rate has fluctuated a fair amount from year to year but is consistently higher than the national average. One year of rate decrease or increase does not make a trend. School-based treatment of substance addiction and co-occurring mental health problems has increased significantly in Denver public high schools, one of the state’s largest school districts. I invite you to learn more about those school-based clinics and the teams of therapists serving them. Last academic year, they worked with 500 students. This year, we’re expecting to see nearly 800 students. The clinics are funded by private philanthropy — and it would be great to see more of them. School-based prevention efforts have increased significantly. Perhaps the message that marijuana is especially dangerous for adolescents in brain development is getting across. I am aware of outstanding efforts to communicate the dangers of marijuana use to young people in Denver Public Schools because they are coordinated carefully with my teams’ efforts to deliver school-based treatment. Here’s the ugly news: Marijuana use among Colorado’s young adults continues to skyrocket. 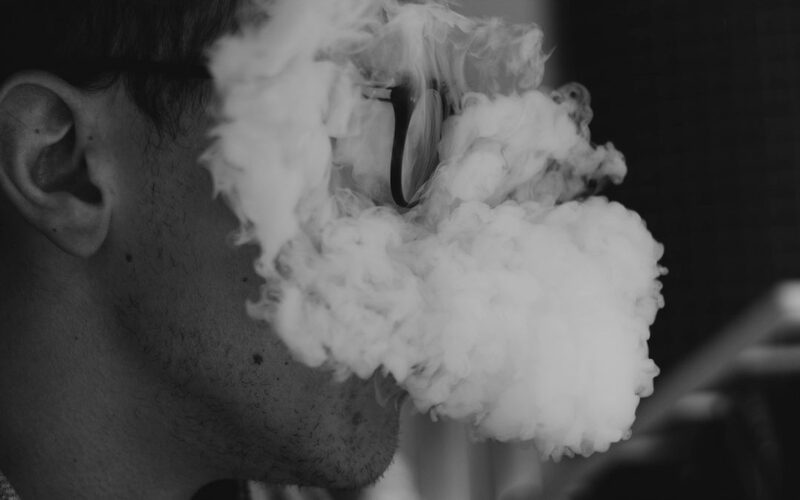 Marijuana use among the state’s 18-24 year-olds has increased 1.4 percent since last year and 29.8 percent since 2009, the year of the state’s de facto legalization/boom in commercialized marijuana. Nearly one-third of people in this age group — 32.2 percent — reported past-month use, compared to the national average of 20.3 percent. Colorado’s 18-24 year olds also lead the nation in reporting first-time marijuana use. This age group captures youth still in critical stages of brain development who are just entering the workforce and starting college. Nearly one-third of these young adults in Colorado are considered current users. Past-month marijuana use: Colorado v. the U.S.